Today, West Warwick resident Vincent “Vin” Marzullo, takes the reins of AARP Rhode Island being appointed the nonprofit’s State President. “We are delighted that Vin has stepped into this key volunteer leadership position,” State Director Kathleen Connell said, in announcing the appointment. “His professional experience, his distinguished history as a community organizer and administrator, and his passion for our mission make him an outstanding choice,” she says. 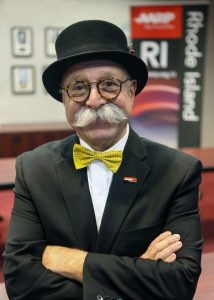 Mazullo brings his life-time of experience to AARP Rhode Island, says the AARP statement. He retired as Rhode Island’s Federal National Service Director, working with diverse communities to identify common ground and bring people together to address community challenges and create new opportunities. He chaired the Combined Federal Campaign (CFC) for RI & Southern MA which raised millions of dollars from federal workers to support local, regional and national charitable organizations. Vin is also involved as a playroom volunteer at Hasbro Children’s Hospital; he is the 2018 recipient of the West Warwick Elks Distinguished Citizen Award; co-founder of the West Warwick Neighborhood Crime Watch and a member Vince Lombardi Sons & Daughters of Italy Lodge. He has been a active member of the AARP West Warwick Chapter since 2017. “For a good part of my career, I was responsible many volunteer arrangements that promoted community building and problem solving particularly for older Americans and low-income neighborhoods,” Marzullo said. Vincent Marzullo has served in a variety of government positions – for the State of Rhode Island, Essex County, NJ – and for 31 years with the federal government as the RI Director of the Corporation for National & Community Service. During the 70’s and early 80’s, Vin was the RI Employment & Training Director, trained thousands of Rhode Islanders for Electric Boat Co. and administered the largest public service employment (PSE) program in the state’s history (4000 workers in state/local government and non-profit agencies) – and served in a similar capacity for Essex County, NJ. As the head of the federal volunteerism agency for RI, Vin had daily responsibility for AmeriCorps*VISTA – the domestic Peace Corps, working with hundreds of non-profits, community development groups & various government entities; and was responsible for more than 4,000 senior corps volunteers that participate in the Retired & Senior Volunteer Program (RSVP), Foster Grandparents (FGP) and Senior Companions (SCP). While in federal service, Vin chaired for 12 years the RI Combined Federal Campaign (CFC) for federal workers – the world’s largest workplace giving program – raising more than $8 million during that period. Vin’s local involvement has been as a member of the West Warwick Pension Board from 1995-99 and again during 2011-13, advocating for greater transparency, improved investment performance, and better scrutiny of disability pensions. A Brooklyn, NY native who has been living in West Warwick for the past 34 years, Vin graduated from Providence College and attended the Manpower Institute (1973) at Harvard University. Marzullo succeeds Alan B. Neville of Cumberland, whose six-year term expired on December 31, 2018.